In June 2001 I went to the Golfe du Morbihan, Brittany with three other members of the BSD EEG (Billy Gawn, Jim Lyons & Paul Barnett). We visited many standing stones (menhirs) and dolmens particularly on the sites around Carnac. Their sheer size and numeracy made a great impression on me and I had to wonder why they were there. Were they to do with astronomy, as they did not appear to have anything to do with religious ceremonies or meeting places? The lack of a reason was very frustrating and made me feel that we are missing something very important that has not been considered before. So, I would like your help in considering what this could be. The Age of megalith building lasted from around 3500 BC to 1500 BC. Why it then stopped throughout Europe is another unsolved mystery. One possibility is that the peaceful farmers of the Stone Age gave way to the more aggressive and warrior-like bands of the Bronze Age. Carnac contains 2934 menhirs in the long lines. There are many others located on other nearby sites and shifting coastlines have ‘drowned’ some megaliths in the Golfe du Morbihan. In 1938 at Avebury, England when a small 8-ton stone was restored to its old original position in the circle, it took twelve men five days using steel hawsers. Dr Alexander Thom, Emeritus Professor of Engineering Science at Oxford University from 1945-1961 became addicted to megalithic design during the 1930’s. At Carnac, there is a ‘knee’ where the rows change direction; Alexander Thom regards the way this was achieved, with the use of two near perfect Pythagorean triangles, as a pinnacle of geometric accomplishment – ‘something that any engineer at any time in the world would have been proud to achieve’. Remembering that there are over 3000 menhirs at Carnac and they each weigh many tons, it seems a reasonable assumption that for the monumental effort involved, they had to confer some really important benefit to the whole community. Specialist information about planetary or other astronomical movements does not seem to be a logical explanation. So, what type of benefit could the stones confer on a community that has not been considered before? Billy Gawn observed that menhirs (stones) placed over the crossing point of underground streams have the effect of suppressing detrimental energies and geopathic stress that rises up out of the ground, as measured by kinesiology and muscle testing. (For further information see his article ‘Little things can mean a lot‘ in the March 2000 Issue 17 of the Newsletter). The area around Carnac has lots of underground water channels and clearing the detrimental energy by placing menhirs at each crossing point of the underground streams would account for the extreme numbers of menhirs and also their non-straight lines. The supposition of Alexander Thom that the lines were determined by man would thus give way to their locations being determined by nature and not from some geometric or astronomic alignment. Whilst I am convinced of Billy Gawn’s excellent research work and observations, I am still not convinced that clearing the area of detrimental energies for eliminating geopathic stress was the primary reason for the lines of menhirs at Carnac. It may have been a contributory reason, but perhaps not the main one. My reasoning is that it would have been far simpler to move the location of the community away from the stressful Carnac area without all the hard labour and many years of stone ‘planting’. The impact of such massive menhirs all being grouped together would be expected to significantly influence the subtle earth energies in the countryside for miles around. It could be that the clearing of detrimental energies would be beneficial for plants and crops, but this is not readily apparent. I am not aware that the area is considered to be an usually fertile one today, even though the menhirs are still standing. It is possible that the fertility of animals improved in the Carnac area, but it still seems an unlikely primary reason for their construction. T.A. Tabraham was convinced that pentagons (which suppress detrimental energy) had the effect of causing the land inside the pentagon to increase in temperature by several degrees (see the article ‘Dowsing Zones get Hotter’ in September 1999 issue 15 of EEG newsletter). There is also the thought that the subtle energies generated from the menhirs could have some effect on the weather. Both of these effects might have been of more significance 5000 years ago than they are today. the purity of the water? Or the prevalence of insects? Or acted as some sort of beacon for boats on the nearby sea? 6 What else could have been of sufficient importance? 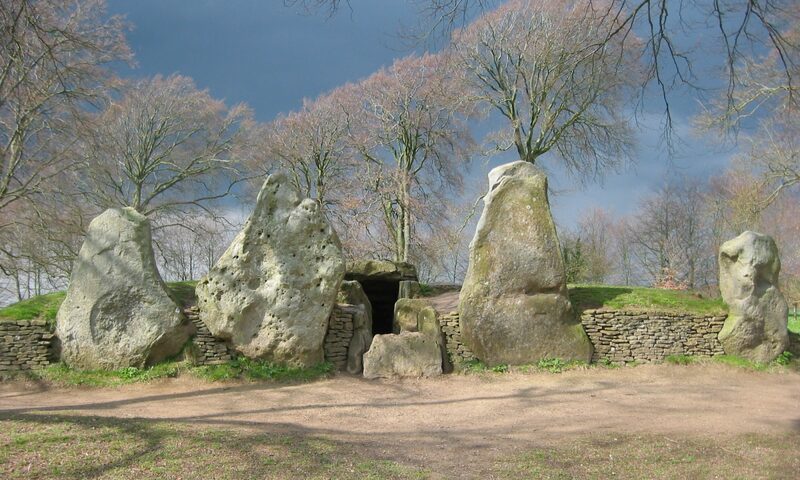 Whatever the reason for the construction of the lines of menhirs, it clearly did not persuade Bronze age man that it was worth repeating the construction as all the stone megalith building stopped around 1500 BC. They were not sufficiently beneficial or understood by newcomers so that the skills and understanding were lost, never to be regained. Or were the benefits replaced by the ‘modern’ technology of their time? Can you help speculate on what the menhirs contributed to the community that was so important to involve many years of massive effort in their placement and construction?